Announcements… Upcoming Events and Releases! CURRENT VERSION 2.6.0.0: Make sure you have the latest and greatest features to enhance student learning! If you still have old versions of the DT Trainer or Activity Trainer, they will not run on Windows 7 or 8 . To refresh licenses or to use the programs in additional self-contained classrooms, email sales@dttrainer.com for a quote. 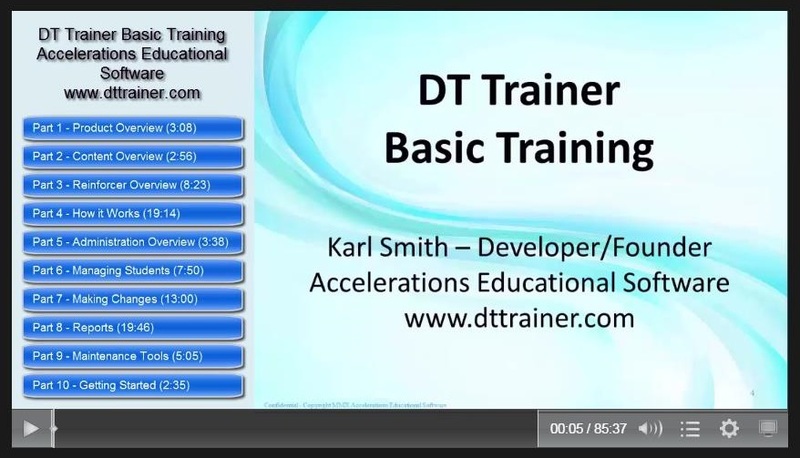 IMMINENTLY AVAILABLE… New DT Trainer Self-Paced Training Videos! Designed to be BETTER than live webinars! COMING SOON… New Report -> Student Configuration & Status! 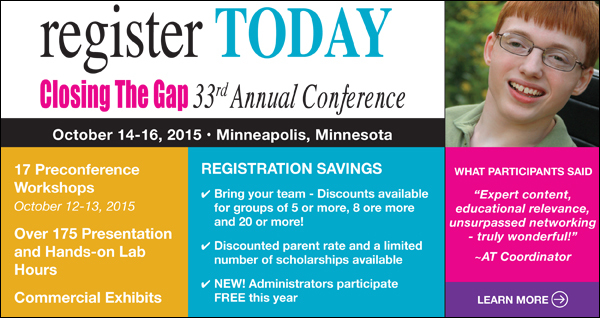 COME SEE US at Closing The Gap… Booth # 313! We will be exhibiting at the 33rd Annual Conference October 14th-16th in Minneapolis, MN. See below ad for more information on conference. Welcome Back! We hope you had a GREAT summer! CURRENT VERSION 2.6.0.0: More releases over the summer! Make sure you have the latest and greatest features to enhance student learning! Schedule a training webinar for your staff, team, or parent group by contacting us at support@dttrainer.com or 803-403-1336. COMING SOON… New DT Trainer Self-Paced Training Videos! Designed to be BETTER than live webinars! Schedule a training webinar for your staff, team, or parent group by contacting us (support@dttrainer.com or 803.403.1336). DT Trainer/ Activity Trainer – Run Available Updates, Back-up Student Data and Take Advantage of EOSY Special! End of School Year Specials through June 30th! Contact us for details! Backup the Student Data before Summer Break! Your IT department may wipe and reimage your computers over the summer. They may even swap them out. Make sure you backup your student data after the last student use of the school year. 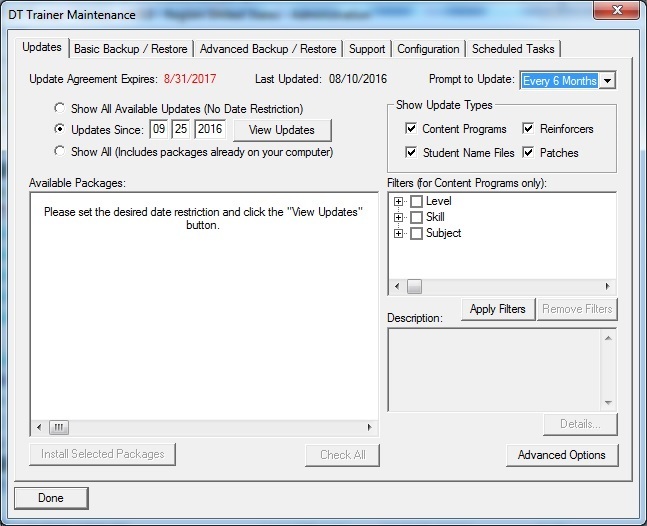 Note: Run updates before backup to ensure you have all the latest features and that student configurations reflect the latest advancements. The current DT Trainer version is 2.6.0.0. Depending on your settings, your DT Trainer may ask you to check for updates upon launching the DT Trainer Administration. If you do not take all the updates, there is a chance you missed some updates. Note: Also run updates before backing up students to make sure you have all the latest features and student configurations reflect the latest advancements. The current DT Trainer version is 2.6.0.0. 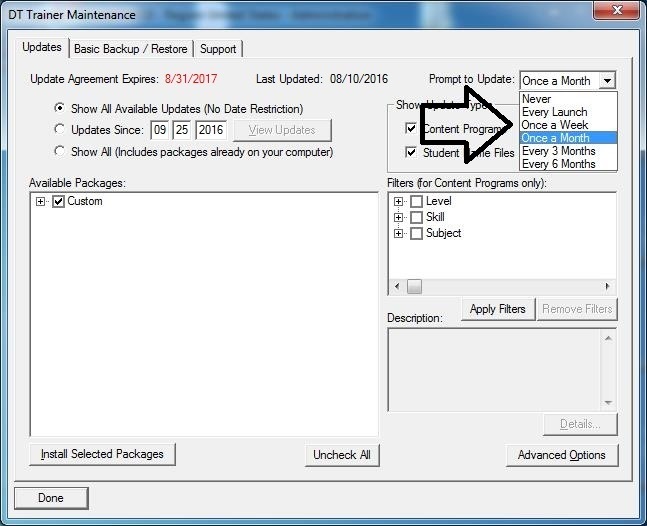 To manually check for updates, launch the DT Trainer Administration, select the Common Administration tab, and then the Maintenance Tools button. The default is to just show updates since the last check. Select the top radio button “Show All Available Updates (No Date Restriction). Depending on how long since the last update there may be none to many updates available shown in the Available Packages List. Click the Check All button. Note: On registered licenses if your update agreement is not current, you will not be able to get updates past your expiration date. Contact AES to purchase an extension on your license(s). 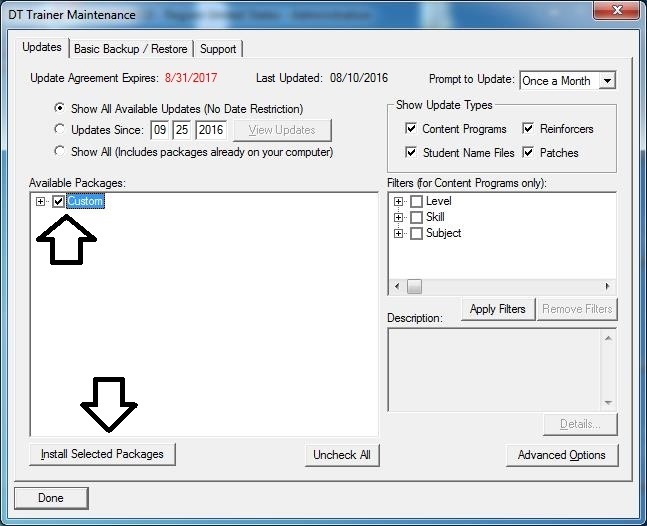 With the Available Packages selected, click the Install Selected Packages button to update your installation with all available updates. You can select how often to prompt for updating from the drop list. 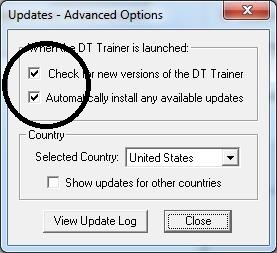 If you select the Advanced Options button, you can automate the update process on DT Trainer launch by checking the options: Check for new versions of the DT Trainer and Automatically install any available updates. Archiving Data for Summer Break! 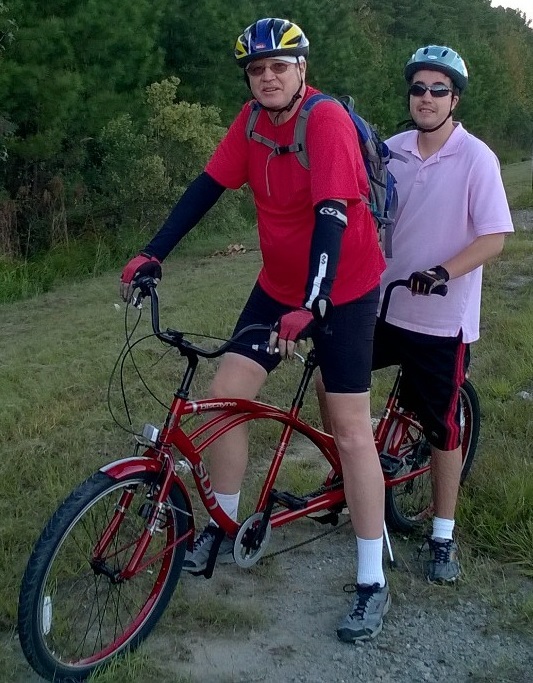 Depending on configuration, you may be prompted to backup upon exiting the DT Trainer Administration. If so, click Yes. If you have set the backup location, simply click Yes to backup. Otherwise, you will need to select or change the backup location. The DT Trainer will provide feedback while backing up the student data. 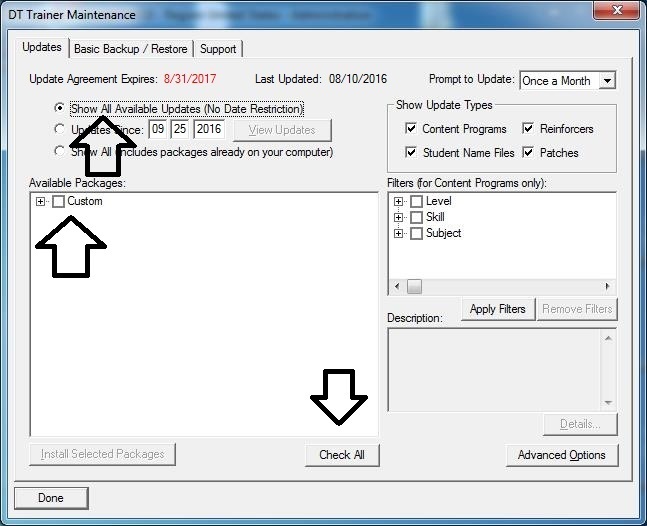 If you are not prompted to backup the student data, the Basic Backup / Restore Tab is accessed from the Maintenance Tools button under the Common Administration of the DT Trainer. Simply verify or set the location, then click the Backup button. 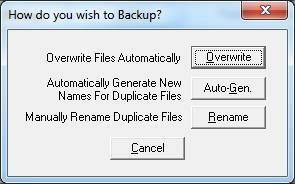 Backups initiated here offer more options for handling previous backups. The prompted (streamlined) backup upon exit is set to overwrite the last backup. Using this manual backup the default is also to overwrite. 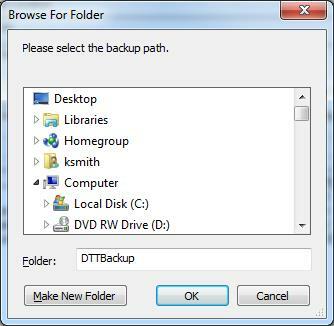 If you prefer multiple backup versions for each student, you must use either multiple folders or use the Auto-Gen or manual Rename buttons shown here. Our newest release (DT Trainer 2.6.0.0) includes the Report Emailer. From most reports, use the default report or configure a report, and then click the Email button. You will see the Report Emailer dialog. If you have already configured the Recipient List and the Mail Settings, simply click the Send button and voilà you are done! Soon you will start seeing the “Help Video” buttons (like shown above) on dialogs to help you more quickly learn existing and new features of the DT Trainer. There are hover help and popup messages to guide you through setup and use of the Report Emailer. The sender is by default the first recipient so the sender will get a copy of the email sent to others. To add a recipient, click the “Add Recipient” button and enter the name, title, and email address. To delete a recipient, click the “Delete Recipient” button. You can select or not select recipients to send to using the check boxes. If you are not going to send now, click “Save Changes” to save any changes to the recipient list. Before sending, you will need to configure the Report Emailer by clicking the “Mail Settings” button. There is even a “Web Help” button to help you get setup. Click “Cancel” if you do not want to send at the time. We have just released the latest version of the DT Trainer. There is a major new feature as well as other improvements. We have completed the Report Emailer feature in the DT Trainer. On most reports in the DT Trainer there is now an “Email” button. With a click, create a PDF file of the viewed report and open the Report Emailer dialog. If the recipient(s) have already been set, simply click the Send button. Recipients can easily be added and will be remembered for use in the future. The recipient list has check boxes, making it easy to select some recipients to email and not others. These selections are also remembered. The subject and message are automatically generated and editable if you want to add anything. This feature makes it very easy to send in class and student level reports to interested parties like supervisors and educational team members. There is hover help over controls and data fields, messages to guide you, and a “Web Help” button to bring up additional information from our website. We have changed the week selection method for weekly reports to make it more efficient to navigate between weeks. Instead of a drop down menu of the weeks, there is a list now to the left of the report so changing the viewed week is a single click. We have made various other changes for report readability that will make it easier to zero in on the critical information. This release is the start of a series of improvements to make training information more accessible and provide a range of reports to meet the needs of different types and levels of users. Enter your information into the fields provided, and then click "Register Now". Schedule a training webinar for your staff, team, or parent group by contacting Karl Smith (ksmith@dttrainer.com or 803.403.1336). Attend a training webinar! We look forward to seeing you! Autism Awareness Special on new DT Trainer and Activity Trainer Licenses – 20% Discount for US School Districts and Institutions until 4/30/2015! The special applies to all Standard Institutional, Single Student, and Power Pack bundles! This is a great opportunity to buy licenses for next year. 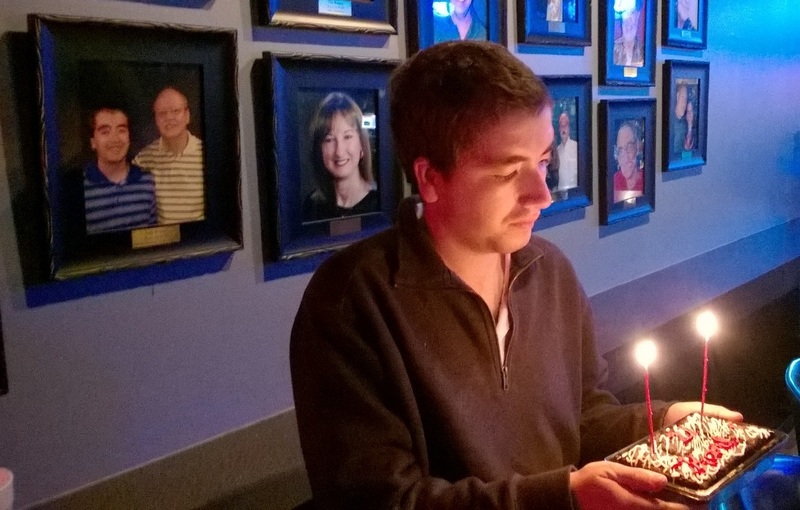 The first year of updates and support starts when a license is registered so you can buy ahead for future deployment. Special webinar trainings in the next few weeks! THIS WEEK! We have ***DT Trainer – Reports & Emailer*** webinars on Tuesday April 14th from 3 to 3:30 PM Eastern (30 Minutes) AND Thursday April 16th from 3:30 to 4 PM Eastern (30 Minutes). You should use or supervise the use of the DT Trainer. This webinar will cover the new Reports Emailer and other issues related to reports.